Windows Vista’s disk management tools are adequate to say the least. Microsoft certainly wouldn’t be given top marks for effort in this section of the Vista operating system. Okay compared with earlier versions of windows, Vista now has the option of extending and/or shrinking a partition and better facilities for backing up files, although you do need the Business or Ultimate versions of Vista to completely image your hard drive; however both these options are nowhere near what can be achieved with third party hard drive management tools such as Paragon Hard Disk Manager Suite 2008. Protect Your System and Data. Securely dispose of hard drive. Click on any one of the main menu categories and an alternative set of options appear to complete the job. These accompanying set of options takes the form of links to other built in utilities. For instance, click on Protect Your System and Data and you will be offered links to enable the backup and/or restoration of your system. While links adequately do the intended job, they do, sadly, tend to cheapen the look of the application. While links are extremely useful for websites I feel buttons would have been more appropriate for this main menu and, certainly far more appealing. When backing up the contents of your hard drive you have the option of either backing up to a secure partition – better known as a backup capsule – created by HDM or copy and burning the files or image to a set of CDs or DVDs. Maintenance is the key to a stable system and one essential maintenance job that should never be underestimated is defragmenting the drive. Defragmenting the hard drive is extremely important. A correctly defragmented hard drive helps increase the PCs performance by ensuring that all relevant parts of a file are stored together, rather than being scattered over the surface of the drive. The defragmenting utility in HDM is not unlike other third party defragmentation tools with the exception that when defragmenting the system drive the application is forced to use the pre-windows environment. This I found to be rather an inconvenience considering that Microsoft’s own defragmenter, along with many third party defragmenters such as PerfectDisk, Diskeeper, etc can defragment a system drive without the need to boot to a pre-windows environment. 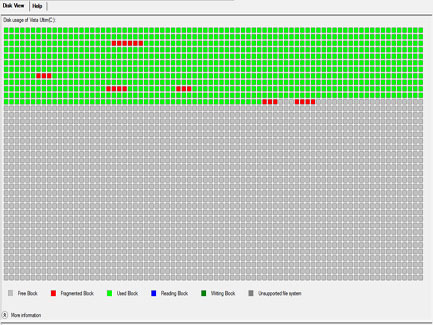 Surprisingly i also found that HDM’s defragmenter took considerably longer to defragment than other well known brands. Defragmenting a 100GB system drive, for example, took well over an hour with HMD, while PerfectDisk took merely 27 minutes. As well as defragmenting the drive the maintenance option also allows the user to copy the system drive along with all its data and then migrate it to a new drive. This is an essential utility if, for example, you decide to upgrade to a larger hard drive. Rather than re-installing Windows and all your applications from scratch on a new drive you can simply migrate the data using this utility. The old drive can thus either be disposed of or, if it is in good working order, pressed into service as a second or backup drive. While it is an easy matter to backup or restore an image to a hard drive, it is not usually all that easy to pick out single files or folders for restoration. With the Rescue and Recovery option of HDM you have just that option. By clicking on the Transfer File option you can back up individual files by selecting them from the available list. Fig: 3 Transfer files from the right hand pane to the clipboard pane on the left. From here on it is just a matter of saving the files to another drive or CD or DVD. Restoring files is just as easy. Just open the Rescue and Recovery, select the location of the backup files, select the file(s) you want and then restore them to their original locations. At some point your PC is either going to become outdated or else pieces of the hardware are going to start to fail. Inevitably, the point will arrive where you will want a brand new all singing all dancing model, with all the latest bells and whistles. However, once you have splashed out on your new computer you are faced with another dilemma, what to do with the old one? Well you have two choices: you can dump the machine at the local recycling centre, or you can give it away to a deserving cause or relative. Both options are admirable; however, aren’t you forgetting something? What are you going to do about all the sensitive data already stored on the hard drive? How are you going to remove it so no one else can access it? Your first and most obvious thought is to re-format the drive. Well, of course, that is one solution – probably not the best, but a solution at any rate. The problem with just formatting a drive is that anyone with knowhow and the correct software can easily resurrect every piece of data that previously existed on the hard drive. The Securely Dispose of Hard Drive option has its own solution – Disk Wiper. This enables the user to completely obliterate any sensitive data stored on the hard drive, firstly by formatting the drive and then by randomly writing 0’s and 1’s over the whole surface of the drive platter(s). This completely removes all data on the hard drive enabling you to pass on or dispose of the drive knowing that if the drive ends up in the wrong hand the person(s) who obtain it are not going to be able to access any sensitive data on the drive. The drive will simply be blank. The final menu category of the HDM Suite is Advanced Options. From within this section you can do all of your partitioning work, from creating a partition to resizing and deleting un-necessary partitions. As stated at the start of this review HMD relies upon a backup capsule to protect any images of your hard drive. When you first create a backup capsule you allocate it a specific size. Obviously, over time, you may make incremental backup which, inevitably fill the available space allocated to the backup capsule. 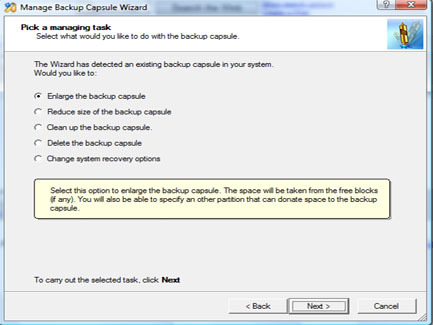 By checking the options available in the Manage Backup Capsule section you will be able to make adjustments to the backup capsule by either enlarging or, if necessary, decreasing the size allocated to the capsule. The final advanced option is Boot Manager. This enables anyone running multiple operating systems to choose which operating system to boot to. With most dual boot operating system users nowadays preferring virtual machine software, the use of third party boot managers is somewhat on the decline. However, if you don’t want to use virtualisation software, the boot manager option can be a useful addition to your arsenal of maintenance tools. 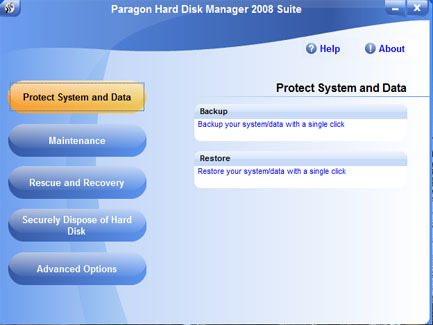 Paragon Hard Disk Manager 2008 contains a complete set of maintenance tools designed specifically to keep your hard drive in tip top condition. 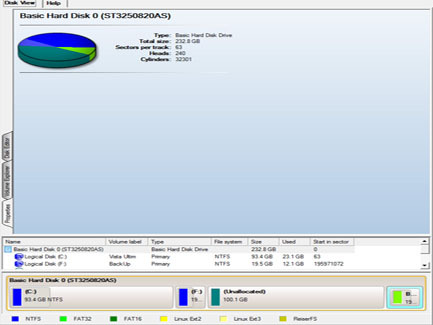 Regardless of whether you simply need to partition your hard drive, clone or image a drive, defragment or securely erase the drive contents Paragon Hard Disk Manager Suite 2008 has a utility to complete the job; making it an essential addition to ever computer users’ tool kit.